Continue on to watch an archive of the stream and to check out the TGT recap. First player shown is Babe Ruth. Road to the Show info coming March 8. New suite of hairstyles, skin improvements for player creation. Legend Pee Wee Reese shown. Judge's Chambers in NY shown. Gameplay focus this year is on 'competitive gameplay,' per Leahy. Designer Chris Gill joins the stream: "Complete overhaul with our tag system." "Tags were a big problem last year." Aiming to eliminate exploits and frustrations, especially in online competitive games. Examples of tag system improvements from 17 v 18 shown. Same person who wrote tag system wrote running system. Hundreds of new animations and months of new logic added. Gill: "Online games need to be fair, need to balanced." Want to make it where users cannot blame the game for a loss. Hundreds of new animations added for catcher blocking. Examples of catcher improvements from 17 v 18 shown. Examples of pitcher fielding efficiency improvements from 17 v 18 shown. PCI discussed, disclosed. Importance of power in regards to PCI shown in charts. Opacity of the PCI has been lowered since the closed Alpha took place. Contact will now be graded this year. Lead AI Engineer Jeff McArthur joins the show in place of Hass to discuss physics, which he helped write and place into the game. After an audit of the improved physics added into MLB The Show 17, proper air density now included/updated into the game. Entering in proper real-life data on home runs into the game will now see home runs landing in virtually the same spot in game as in real life. McArthur leaves and Hass returns. New legend revealed: 9-time All-Star Vladimir Guerrero. 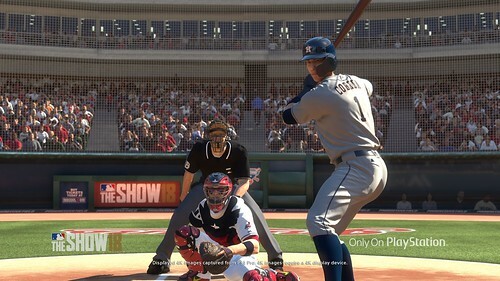 The next MLB The Show 18 news will come on February 12 as part of the weekly GameStop Monday release.